Teachers are breaking new ground by including the Native worldview in their classrooms, said SHI President Rosita Worl. “For so long, our Native students haven’t seen their cultures reflected in schools, and in many cases they’ve seen their cultures misrepresented. It is so important to teach children about the Native worldview to promote cross-cultural understanding, and I celebrate Nancy for the work she is doing,” Worl said. SHI Art Director Kari Groven said the lesson is a great example of incorporating indigenous history into the classroom. In building the art lesson, Lehnhart researched historical perspectives from both sides of the battle, drawing on Richard and Nora Dauenhauer’s celebrated book, “Anóoshi Lingít Aaní Ká: Russians in Tlingit America,” written with Lydia Black and published by Sealaska Heritage. The book, which won an American Book Award, is a multicultural history of the Battles of Sitka that presents translations of first-hand accounts, including Russian historical documents and Tlingit oral history. Lehnhart also received input on the content of her lesson from Sealaska Heritage staff, Steve Henrikson of the Alaska State Museum and Kai Monture of Yakutat. Lehnhart said though the Battles of Sitka is a complex topic for third graders, they were very receptive to the lesson. The school district recently made changes to elementary school curriculum due to community concerns about distorted descriptions of Alaska Native experiences and history. According to the JSD website, one in five of the district’s students is of Alaska Native heritage. Lehnhart incorporated the study of a Tlingit helmet into the lesson, showing the class a modern example carved by artist Donald Gregory/Héendei that has a Raven design carved from a spruce burl with abalone and copper inlays. 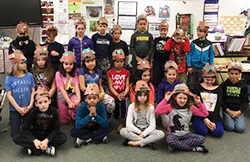 Students created their own paper helmets at the end of the lesson. “The art activity offers a way for them to connect to this time in history and the information about Tlingit warriors,” Lehnhart said. Another point of access for the students, Lehnhart said, was a discussion of the Tlingit core cultural value of Haa Latseen, strength of body, mind, and spirit, an important aspect of traditional Tlingit warrior training. Kai Monture provided Lehnhart with a five-point “warrior code,” translated by his grandfather, that includes “reach for the hand of your fellow man” and “never make yourself ‘heavier’ than others.” At the end of the lesson, Lehnhart asked the kids which of the five values they were most inspired by and wished to work toward, an exercise that seemed to resonate with them. “They took it seriously and respectfully. I was really touched by their sincerity,” she said. In addition to marking changes in school district curriculum, the project represents on ongoing partnership between SHI, the Juneau School District and University of Alaska Southeast to increase collaboration on educational efforts. 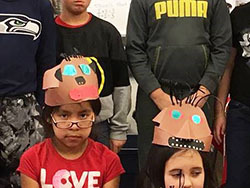 Previous SHI collaborations with Lehnhart include a formline art kit distributed to Southeast Alaska schools in 2015, and an art kit focused on clan houses that helps prepare second grade students for annual excursions to the Walter Soboleff Building as part of the Any Given Child initiative, a national program overseen by the Kennedy Center. We encourage teachers to incorporate Northwest Coast art concepts into their classrooms and to use materials from our art resources page.